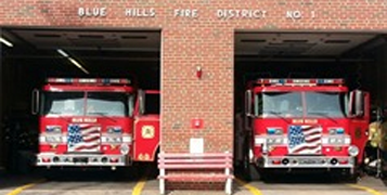 Blue Hills Fire Department – Serving the community since 1926. The Blue Hills Fire Department is more than a protector of the community. Our firefighters are a part of it and we offer several events during the year to support the people who live, work, and visit this beautiful part of Connecticut. We also want to help the less fortunate with our annual coat drive, which has provided warm garments and funds, and various food drives. The firefighters also adopt families during the holidays, people who we will never meet face-to-face because their privacy is protected through the appropriate social services, but men, women, and children that we consider part of our family. Our education goals are simple: to help people avoid danger and, when that is impossible, know how to react during an emergency. Our annual May event gives the public the chance to safely experience a smoking vehicle and ask questions of us and the other first responders join in this important community event, like the police who teach the proper installation method for car seats. Funds raised support the Connecticut Burns Foundation. We visit schools, especially during October, National Fire Prevention Month, to show children the equipment we use to battle fires, including the gear we wear and the trucks we drive. We also start a good fire to cook up some tasty hot dogs and other refreshments for our visiting friends! The firefighters are proud to participate in meet-and-greets with Boy Scouts, youth groups, and church organizations to provide information and conduct activities that will make for a safer community for all of us. We offer an internship program to Bloomfield High School students who win an essay contest and are in good academic standing. Two to four students who might be interested in a public safety career have the opportunity to work alongside firefighters, listen to guests speakers from various emergency service disciplines, and gain a unique educational experience over six weeks. The need for firefighters is as old as fire itself and always ongoing. We won’t sugar coat it—the work is physically and emotionally demanding but, when you go on your first call and see that you can make a difference in somebody’s life by helping them, it makes you feel good inside. Firefighters are respected in the community for their service and integrity. We don’t stop helping once a fire is extinguished. We help people who have lost their homes by working with the American Red Cross and do everything in our power to assist those who have experienced an emergency situation. The firefighting community is a brotherhood and sisterhood like no other. If you would like to consider joining us, please fill out this application form.